This expo did NOT disappoint, and the age group and attendees were very surprising. Even the exhibitors were shocked as they scrambled to get more products to their booths. One exhibitor was from Leamington, Ontario which is very close to where I am. Sun Parlour Growing Supplies had to make an urgent call for their store to drive 4 hours overnight to re stock their booth. Even display models were taken down to satisfy customers. I have to write a separate article about this amazing company and how they have built an additional business since Cannabis became legalised. For a first expo they attracted some big names, but I have to say for me and my road trip buddy Denise, we decided hands down that the Education Station was the busiest interactive exhibitor. One of the guys at Education Station said the most memorable moment for him, was when a 75 year old man asked if he could be taught how to roll a joint because he wanted to impress his son. I wish I had been there to film that moment. During the event I had the opportunity to talk to several visitors. They ranged from total newbies and eager to learn, true expert growers who wanted to see new technology and then there were couples who were overwhelmed with the knowledge that it is now legal to grow and wanted to know where to start. 7 Acres were one of the sponsors in the outside lounge. Check out the link to their website to find out how the company was started. The founder had a daughter with chronic pain and the rest is history. This area was much appreciated by attendees and vendors. There were heaters outside and tents set up. 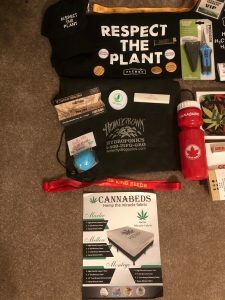 7 acres were also giving away t-shirts, lighters, and hats with their tag line “Respect the plant”. “You’ll be able to come to the show with your own cannabis, up to an ounce, sit in a seminar, go buy a grinder and sit in the Hot Box Cafe and roll yourself a joint. 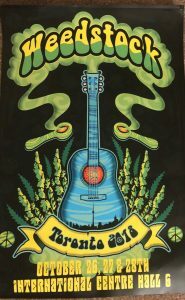 Then you can go outside and you can enjoy your legal cannabis in right at the event,” Irving said. There is so much to write about this event, so it looks like I will write part one today. In part two I am writing about the amazing Harry White who started a business in a box – well it comes packed down in a box but it is a custom room called Weegro. It is a custom growing room complete with lights, ventilation, heat and humidity regulated that you can have in your home to grow your medical Cannabis very discreetly. Bella Vita Bath Bombs are another great company who gave me a sample which I need to try tomorrow. I heard about them LONG before I attended the event. This famous Hamilton based company knows their stuff and that is why they have such an amazing following. Tour Buds: OMG you have to book the bus. 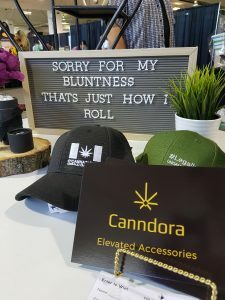 What a great idea with the “budding” Cannabis Tourist Industry. Can be rented for stag nights, hen nights, Corporate events, hire it for an educational event with up to 15 people in it. But the BIG message I wanted to convey was how easy it was to get to this event. There was no charge for parking, and no lack of parking, great food vendors were there (including Vegan and Vegetarian food), the Education Station was a brilliant idea, the Seminars were so educational. 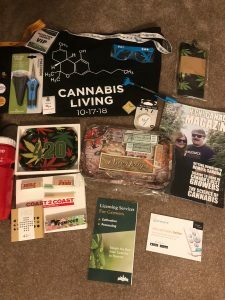 We also loved how every seminar was announced so you did not miss any of the great speakers which included how to grow, The Amazing ladies who wrote the Cannabis cook book *** a great book idea for Christmas, the Delta 9 chefs (ooh the smells from the stage were mouth watering) and the great gals from Canndora. If you did NOT ATTEND this event, you have to remember the name as it will be BIGGER next time. Rumours are that they will be holding their next event in March in Halifax, Nova Scotia. Who wants to go? Just in time for newbies to learn how to grow their first 4 LEGAL plants.